Rome wasn’t built in a turn, but it certainly was destroyed in one. After sweeping through northern Italy I’ve brought my combined Visigoth/Ostrogoth alliance to the seat of the Western Roman Empire. Four thousand men surround the fabled city of seven hills, while a mere thousand guard its walls. Old Rome is about to fall to the horde—two civilizations that don’t even possess lands of their own, instead traveling en masse across Europe. The Dark Ages are upon us. 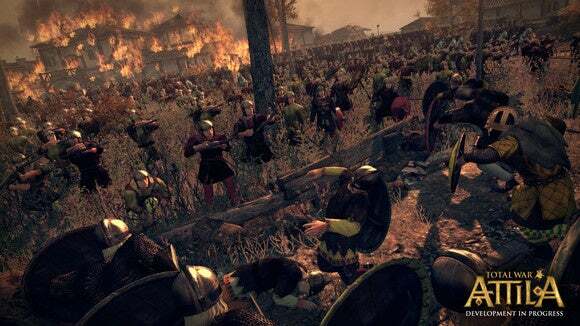 Total War: Attila is, as I wrote in my preview, absolutely brutal. The game takes any chance it gets to juxtapose the titular Hun with Christian imagery of the apocalypse. In keeping with that theme, this is more a game about destruction than creation. That’s strange for a 4X game. Typically the goal is to build—to uncover new technologies and grow your fledgling state into a massive empire. There’s still a bit of that in Attila. This isn’t a complete reassessment of the genre. You’re still progressing through tech trees, managing your population’s needs through various buildings, et cetera. I expect that’s even more true of certain factions. Playing as either the Western or Eastern Roman Empire, for instance, you’ll start with vast holdings of land and try your best to hold on to at least a bit of it. The post-Roman era is so turbulent, however, it’s introduced a completely new concept to the fifteen-year-old Total War series: Migratory factions. The Huns are the obvious example—a warfaring horde that swept out of the east and across the Roman Empire, sacking cities as it went. Other factions share similar traits though, including the Visigoths and Ostrogoths. I chose the Visigoths for my own playthrough, and what followed was unlike any Total War campaign I’ve ever played (and I’ve played a fair number over the years). The Visigoths start with two armies. That’s it. No fleets, no cities, nothing. Further examination reveals that these two armies are actually two “hordes”—basically mobile cities, with their own ruleset. On any turn you can “encamp” a horde and enact typical city behaviors, like creating new buildings or raising new armies. Then you can pick up camp the next turn, rouse the troops, and attack the nearest town. The Visigoth campaign turns into wanton destruction. Starting in the Eastern Roman Empire I carved a swathe up the Grecian coast, alternately liberating cities (and thus returning control to smaller factions that become my military allies) or razing them to the ground. This latter action burns the entire region to the ground, leaving it just an empty space on the massive Total War chessboard. It’s scorched earth. 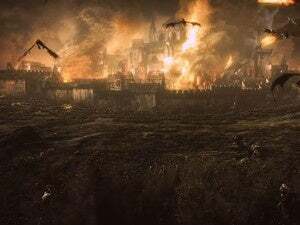 The combination of these two aspects—mobile “horde” city/army hybrids and razing cities—is what makes this the most brutal Total War ever made. After Greece I cut down through Italy, eventually linking up with the Ostrogoths and co-conquering Rome. Then I swooped into Spain and burned it all to the ground. I didn’t even really have an end-goal in sight. In past Total War games it was “conquer as many cities as possible and grow the empire.” Here, though, I’m left with a style of play that actively rejects cities. At any time in the campaign you can conquer a city and decide to settle down in it, ending your migratory phase. Doing so is a massive shift though, and upon doing it at one point I decided to reload and go straight back to my campaign of destruction. The Saxons became my tributary state. Then the Danes met the same fate. The Angles I simply wiped off the map. All this without having a single city under my direct control. The "Total War" series title has never seemed more appropriate. This isn’t an empire simulator. It’s about burning empires to the ground. It’s the ultimate historical David and Goliath story—bands of roving barbarians slowly crumbling the great Roman Empire, with its poetry and aqueducts and roads, into forgotten dust. And I don’t know how I feel about that. In past Total War games you’d slowly see the map congeal into two or three colors as mighty empires were forged. In Attila the map is slowly turning one color, but it’s the pale parchment yellow that signifies a “blank” tile—another city razed to the ground. Between the Huns slowly destroying the Eastern Roman Empire and me the West, we’ve reduced parts of Europe to nothingness. Many of the remaining areas are under my control by proxy, as tribute states. It’s a fascinating way to play Total War. It’s a new way to breathe life into Total War. The ultra-mobile hordes have a few disadvantages—particularly their slow population growth and the fact that you can’t be building and waging war at the same time—but ultimately it feels like the whole game was designed around this concept. Playing as a “normal” faction feels clunky and unrefined by comparison. 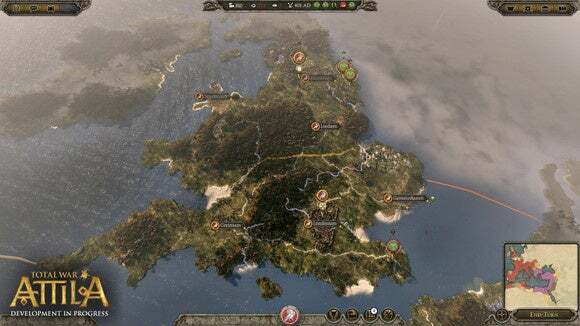 Which makes it all the stranger that the tutorial for the game, the so-called “prologue,” focuses on traditional Total War gameplay. You take over the Visigoths, but in a scenario where they’ve already settled into a city. This leaves you at a disadvantage if you want to play any of the horde-style factions—you’re learning on the fly. 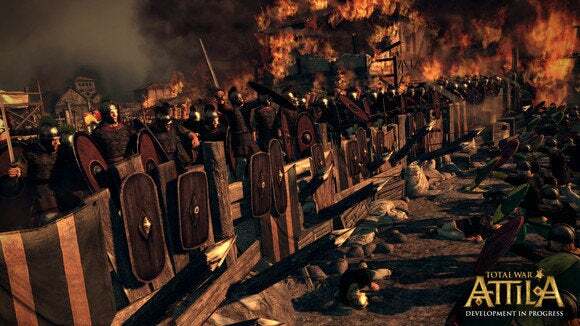 So let’s talk about Total War: Rome II, this game's immediate predecessor. If you’re coming to Attila with a bit of trepidation, I don’t blame you. “Yeah, this all sounds good,” you’re thinking, “but how does it run?” Rome II was an unmitigated disaster at launch and for multiple months afterward. Attila isn’t quite as bad, but there are still rough edges. I’ve had AI turns last upwards of thirty seconds at times, which is entirely too long in my opinion. If I’m reaching for my phone to kill time in between turns, there’s a problem. I’ve also had the game outright freeze after the AI takes its turn, sitting on a weird white fog-screen for twenty seconds while the game struggles to return control to me. This is with an Intel Core i5-3570K and a Nvidia GeForce GTX 970—a fairly beefy configuration well within the game’s recommended specs. 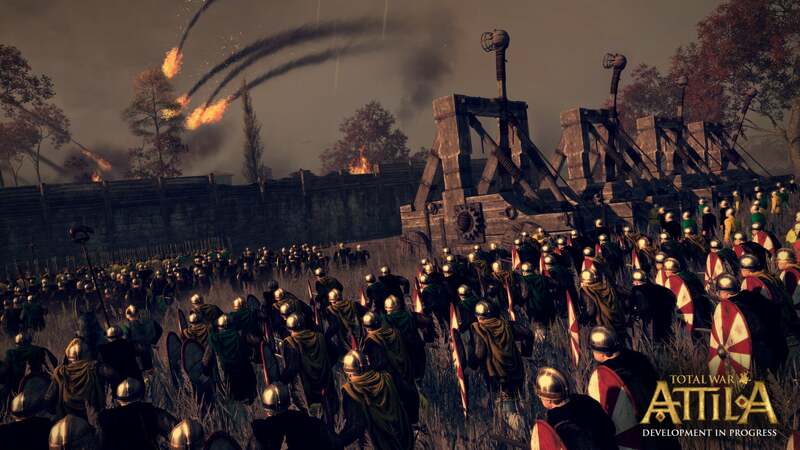 The AI turns are also just as janky as they were in Rome II. The game is trying to show you what the AI is doing while also trying to calculate turns for three-dozen different factions at the same time, so it gives you this weird five frames per second, skipping, halting, creaking imitation of one or two parts of the AI’s turn where you can sort of tell what’s going on but not really. “Did the Western Roman Empire just attack...wait, what’s going on here?” You can never really tell, which forces you to zoom out and take stock of the AI factions after control is returned to you each turn. It’s like the whole thing was spooled together with duct-tape—I’ve only had one outright crash, which isn’t too bad, but the game always seems right on the verge of crashing. Like at any moment, if I do the wrong thing or touch the big red button, this could be the turn where it crashes again. The UI also needs work still. The stylized approach to Rome II has been toned back a bit, but there are still plenty of icons that are completely unintuitive. I found myself mousing over tiny icons and waiting for tooltips to pop up even hours into my campaign, which is absurd. And Total War is still awful at surfacing information. How is food production calculated in each region? Why are you hemorrhaging troops suddenly? What happened to all your money? If I research this technology, what are the specific benefits I get from each building in that tier? Many of these questions require you delve into the extensive Total War Encyclopedia and read the answers, which is an awkward way to learn. As far as the real-time battles go, I think defense is a bit overpowered. Trying to get early-game siege equipment up to the walls against an enemy loaded with decent missile troops is utterly futile. 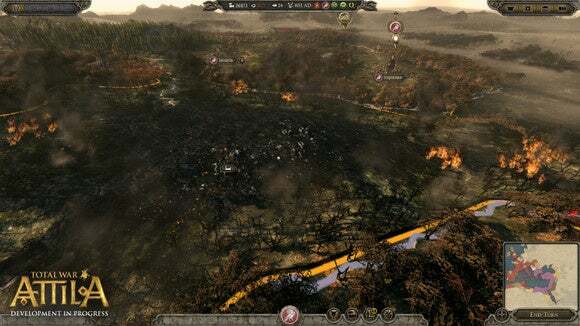 Also, and this should come as no surprise to Total War veterans, pathfinding can be frustrating both in the real-time battles and on the campaign map. I’ve had whole masses of troops slaughtered because they couldn’t figure out how to effectively navigate through a gate, or a battering ram and a set of ladders cross paths and both end up perpetually locked together ten feet from the walls as arrows cut down entire battalions. Again, none of that will come as a surprise to Total War vets. These have been problems for years. At this point it’s just a bit perplexing—why is it still a problem, fifteen years after the first Total War game? 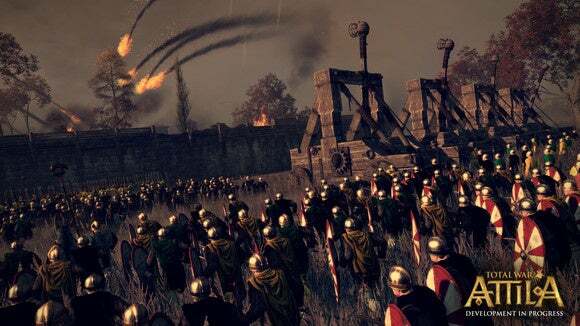 I will say this—Total War: Attila feels like no other game in the series, nor does it really feel like any other 4X title I’ve ever played. Creative Assembly has really taken to the Fall of Rome era and delivered a game that’s as much about grinding beacons of civilization into dust as it is about creating new empires. It’s a bold move for the series, albeit one that wouldn’t really make sense for any other period of history. 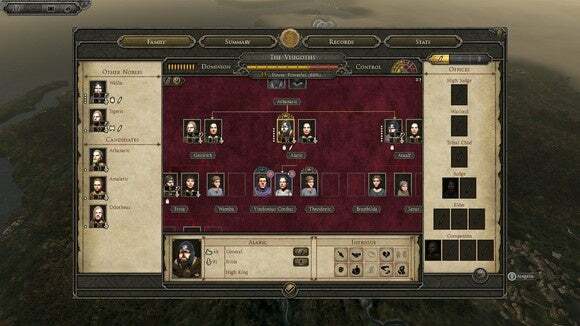 The developers have also managed to rectify some (though not all) of Rome II’s sins, which is appreciated. The game feels like a polished expansion to Rome II, which in many ways is exactly what it is—Creative Assembly might not tout it as such, but this is basically the Fall of the Samurai to Shogun 2 or the Napoleon: Total War to Empire. I like it. I really do. I've already put more time into it than I did Rome II, and I expect I'll be coming back to this one for a while. On the other hand, it's increasingly hard to turn a blind eye to Total War's biggest flaws, some of which have dogged the series since its first iteration. I'd be way more excited with whatever comes next if Creative Assembly led off the features list with "We fixed pathfinding! AI turns take a reasonable amount of time!" instead of cramming new complexity into the game. Fix the foundation. Then add on top. Every 4X player knows that's the basis of a good empire. Good news: The latest Total War game is better than Rome II at launch. But that doesn't mean it's perfect.